Your long-haul flight is touching down in Dubai and you want to make a stopover of it – but do you stay in the United Arab Emirates or head to nearby Oman? Here’s my verdict after trying both options. Increasingly Kiwis heading to Europe are flying via Dubai, and with the good service and competitive fares offered by Emirates, why wouldn’t you? Let’s say you’ve bought your tickets and rather than punishing yourself with 24 hours of more-or-less non-stop flying, you’ve decided to stop over for a few days. You might then wonder whether to spend those days in Dubai (or elsewhere in the United Arab Emirates), or scoot across the border to Oman instead. On my most recent trip to Europe I put both those options to the test with three days in Dubai and five in Oman, most of which I spent in the capital, Muscat. Reaching a verdict wasn’t hard, and I’m not going to leave you guessing about which destination I’ll pick in future. If you have only a few days to spare and you like giant shopping malls, sky-high prices, over-the-top consumerism and ersatz culture, by all means stay in Dubai. Wooden boats called abra jostle for space on Dubai Creek. If, on the other hand, you want to experience authentic Arab culture, do your shopping in a bazaar where the air is thick with frankincense, and actually meet some Arabs, you need to go to Oman. In Dubai’s defence it does have some extraordinary buildings, including the 828m-high Burj Khalifa. The neighbourhoods where the city’s ex-pat communities, mostly from the Indian subcontinent, live and eat are vibrant in a way you won’t find in slow-paced Oman. Dubai’s public transport is good and, astonishingly, the taxis are cheap, honest and fast. 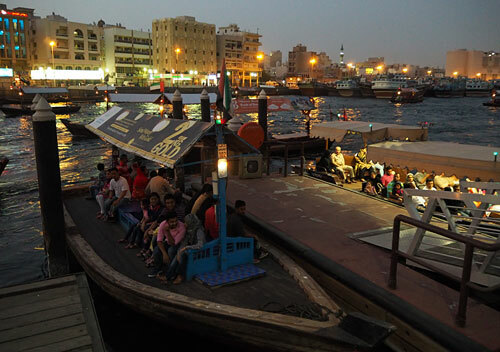 In a city which worships wealth and pointless consumption there are still a few treats for the budget traveller – my favourite thing to do in Dubai was to catch the wooden boats called abra that careen back and forth across Dubai Creek at dusk for just 1 dirham (NZ$0.40) a time. And you do have to take your hat off to Dubai’s rulers for creating a new economy built on finance on tourism instead of just waiting for the oil to run out. But Oman is everything Dubai is not. It is stubbornly traditional and low-rise. 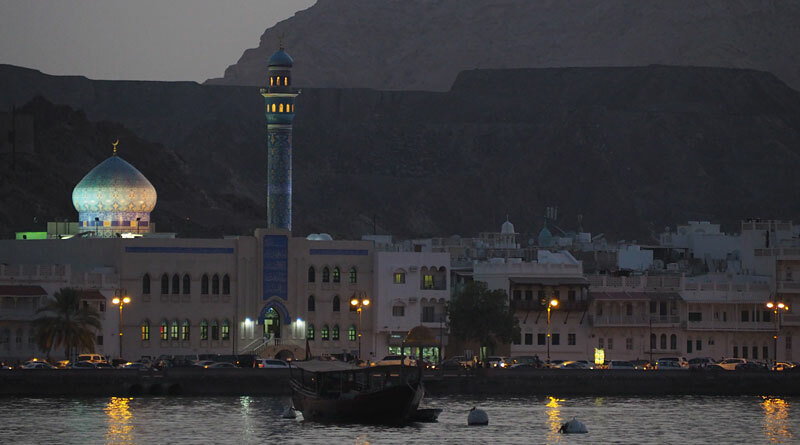 The skyline of Mutrah, Muscat’s old port, is straight out of The Thousand and One Nights with minarets and fortresses set against improbably rugged mountains. The souq (covered market) – if you overlook the plasticware stalls and cellphones – has barely changed in centuries. Men still wear traditional robes and embroidered hats and pass much of the day sipping cardamom-scented tea. 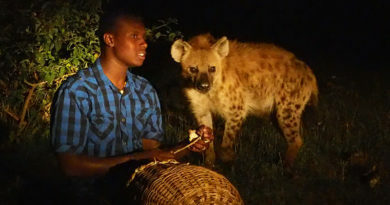 Best of all, you can actually meet locals, who are kind and welcoming in a low-key, unassuming kind of way. 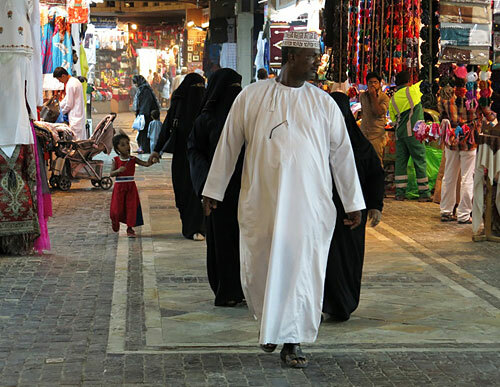 A man and his wives in the Mutrah souq (covered market), Muscat. 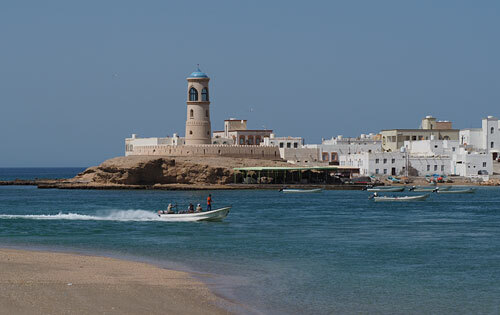 Oman isn’t a budget destination but it isn’t outrageously expensive either. The only thing in Oman which might make a backpacker wince is the cost of accommodation. I stayed in the second-cheapest hotel in Mutrah, which set me back 20 Omani riyals (NZ$80) a night. However, for that I got breakfast, air-con and a waterfront location with views over the port and the Sultan’s superyacht. Oman is also the only country I’ve been where the price I ended up being charged for a room was lower than the quoted price. That happened at every hotel I stayed in, even when I’d booked and asked for the price in advance. 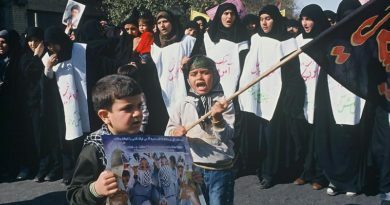 Oh, and for anyone paranoid about the Middle East: I didn’t sense the tiniest hint of tension or hostility. Even the armed soldiers guarding the Sultan’s palace were relaxed and polite. The only downside of Oman, at the time I visited anyway, was the heat. By 9am the thermometer was already nudging 40 degrees C. I soon realised it wasn’t laziness that shut shops and emptied streets between noon and 5pm. It was survival. From Dubai you can fly to Muscat, Oman’s capital, in just over an hour. Flydubai, for example, does a one-way fare for 420 dirhams (NZ$170). Or, if you’re on a budget and fancy a bit of mild adventure, you can take a bus instead. Mwasalat (formerly the Oman National Bus Company) operates three modern buses a day in each direction, leaving Dubai at 7.30am, 3.30pm and 11pm. Buy your ticket in advance if you can and allow plenty of time as office hours seem a little erratic. 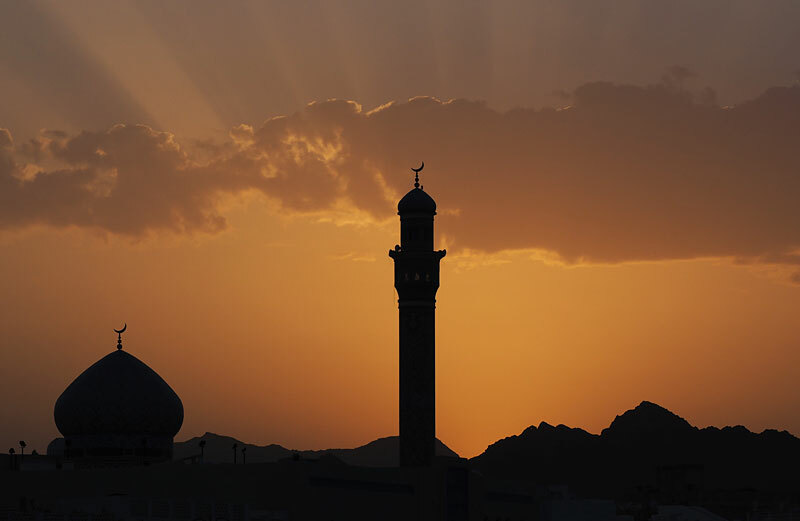 The booking office closes for a few hours in the middle of the day on Friday, Islam’s holy day. Finding Mwasalat’s tiny booking office wasn’t easy. It’s in a district called Deira on a sidestreet possibly called 28A Street (but don’t hold me to that) just east of the Deira clocktower on Abu Bakr Al Siddique Rd (one of the city’s main thoroughfares). Al Rigga is the nearest metro station. Possibly the easiest way to find the booking office is by asking for directions to Caravan restaurant, which seems to be well known and is a few doors away. Or you can try to follow Mwasalat’s location map. At the time a one-way ticket to Muscat was 55 dirhams (NZ$22) and return 90 dirhams (NZ$36). I opted for a return but almost regretted it because the booking office in Muscat wouldn’t honour it, claiming it was a one-way ticket. I persevered and eventually got my return journey without having to buy another ticket. The buses leave from a sidestreet across the road from the Mwasalat office. Make sure you’re there half an hour in advance. The formalities at Al-Hatta border crossing were straightforward. I was issued an Omani tourist visa on the spot with no charge, a recent and very welcome change for Kiwi travellers. If you have to pay a 30-day visa cost 20 riyals (NZ$80) and a 10-day visa 5 riyals (NZ$20). You can check the requirements for other nationalities or order an e-visa at the Royal Oman Police website. 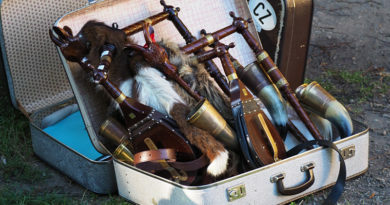 A less happy surprise was on the United Arab Emirates side of the border where the government had just introduced a departure tax of 35 dirhams (NZ$14). Make sure you hang onto your receipt. The only delay came on the Omani side where all passengers had to pile off the bus with their luggage for thorough examination by a sniffer dog. After a six-hour trip the bus dropped me at Ruwi bus station in Muscat’s commercial district. From there it was a short trip by city bus 4 (fare 200 baisa, NZ$0.80) to Mutrah, the city’s historic port area.